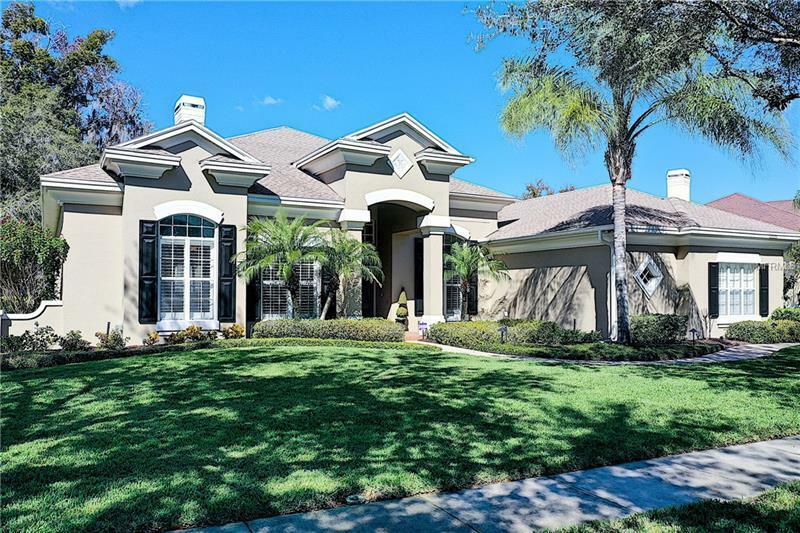 Stunning Arthur Rutenberg lake front custom-built pool home located in the exclusive gated Pasco Sunset Lakes. Amenities galore with 8' doors throughout, towering 13' ceilings and tray ceilings with back lit crown molding in the family, living, dining, master and master bath room. 4br 3.5 baths + bonus room, Den and oversized 3 car sideload garage. This open plan offers a Gourmet island kitchen with 42" wood cabs, granite tops, double oven, walk-in pantry and breakfast area. The formal dining, living, family rooms and den/office all feature custom built-ins and a gas fireplace in the living rm. The floorplan is a three-way split with Jack & Jill bath between bed rms. 2 & 3, 4th bedroom is located off the back corridor that leads to the pool bath and large bonus/game room. The master suite is spacious with his and hers walk in closets. The master bath has just undergone a beautiful makeover with a free-standing tub & frameless shower glass. Out back are two spacious under roof lanais with grill/kitchen, a heated pool/spa and all enjoying amazing views of ski-size BIG LAKE VIENNA. Inside you will also enjoy the beautiful and relaxing lake views from the living, family, bonus and master bed room. This home offers everything you would expect in a custom home, built-ins, columns, crown molding throughout, plantation shutters and so much more. The community includes a playground, boat ramp and NO CDD! This central location is convenient to shopping, restaurants and just 25 minutes to the airport.